Convatec Aloe Vesta Protective Barrier Spray is a unique formulation that protects sensitive skin. If you have a sensitive skin then this spray is a handy solution that you can rely on. It helps to prevent pressure ulcers and other skin injuries. Aloe Vesta barrier spray is a handy solution for most of the minor wounds and skin injuries. When you give a light press, a fine mist of spray coats your skin evenly. Want to know about this barrier spray recommended by health experts then read this review. Aloe Vesta barrier spray is a handy solution for most of the minor wounds and skin injuries. When you give a light press, a fine mist of spray coats your skin evenly. This coating helps to provide apt moisture to the skin and repels urine leftovers. It is a skin-friendly mist and a non-alcoholic formulation. Aloe Vesta spray soothes irritated skin and provides comfort. The best part is that this spray is baby-friendly and you can use this to prevent diaper rashes. You do not have to touch the red little bumps and cause pain to the babies; instead, a spray will do the job. It clears off the irritation and brings the skin back to its normal state. Convatec is a renowned brand and aloe Vesta spray is one of their products. You can also find a similar variant product that comes in a cream form. There are many other skin therapy products under this brand and they have quite a great reputation in the market. The major ingredient of this product is petrolatum and rest of the inactive ingredients include: Hexamethyldisiloxane, Softisan 649, Mineral Oil, Aloe Extract. This spray is for external use only and do not apply this on deep wounds, serious burns and animal bites. Avoid contact with eyes. In addition, this product is flammable so keep it away from heat, light, and fire. Do not puncture this product and never try to inhale the content intentionally. Keep this product away from children. In a case of accidental ingestion, call the poison control department right away without any delay. Make sure not to overspray and shake it well before use. Hold the bottle 5 to 6 inches away from the skin and spray gently. According to customer feedbacks Aloe Vesta Protective Barrier Spray is easy to use and apply. They say that this spray eliminates the need for direct skin contact. They say that a light press is more than enough to spray the contents evenly on the skin surface. The petrolatum base forms an occlusive barrier across the skin and protects it from irritation. They say that this spray helps to keep moisture intact. Some customers say that this spray keeps the skin from degrading when they are in frequent contact with feces, and urine. 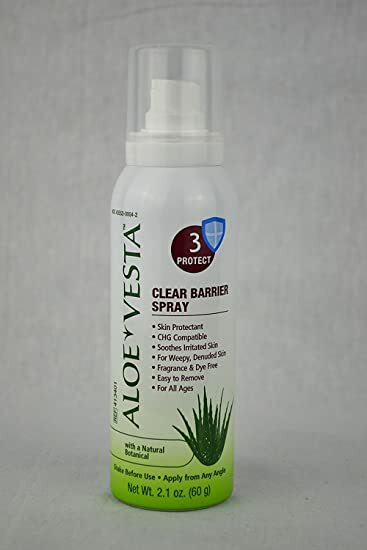 Conclusion: Aloe vesta mist barrier spray is a good choice if you are looking for a product that eliminates direct skin contact and effective results.